Elephants have always been one of my favourite animals. I feel like I can relate to their gentle giant, slow-paced nature coupled with their tough, dry skin and a over-sized noses. The rolling about in the mud thing not so much. When I had put on a bit of weight in Tanzania, my friend used to call me ‘Tembo Mdogo’ which translates as ‘little elephant’. Not the most charming nickname admittedly, but it stuck and I secretly kinda liked it. My collection of elephant related tokens has been expanding, but I have never actually been up close and personal with these massive and majestic creatures. Until now! My day started early with a 60km drive out of Chiang Mai. An introduction video was played as we made our way there, strangely presented by Lou Carpenter from Neighbours wearing a upsettingly tight tank-top. 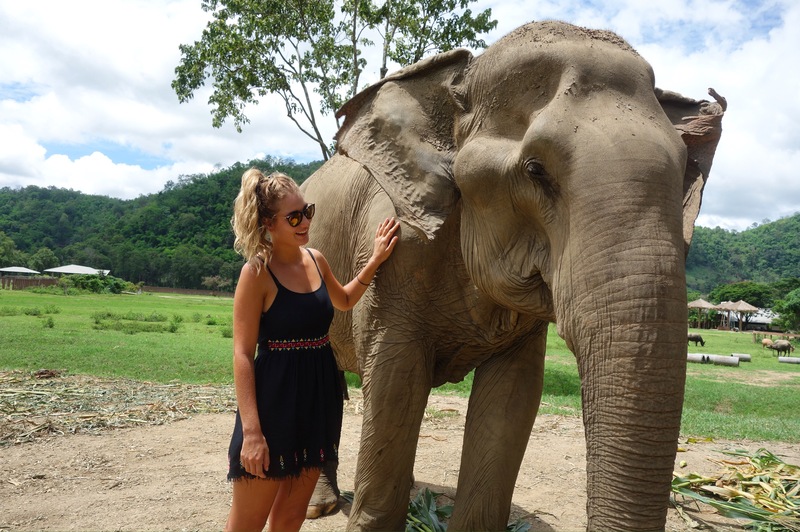 We learnt about the founder and the history of the park, and the type of hardships from which the elephants are freed including illegal logging, the circus or public shows, street begging and touristic elephant riding companies. The most horrifying part to watch detailed how these humongous animals come to be so meekly obedient. 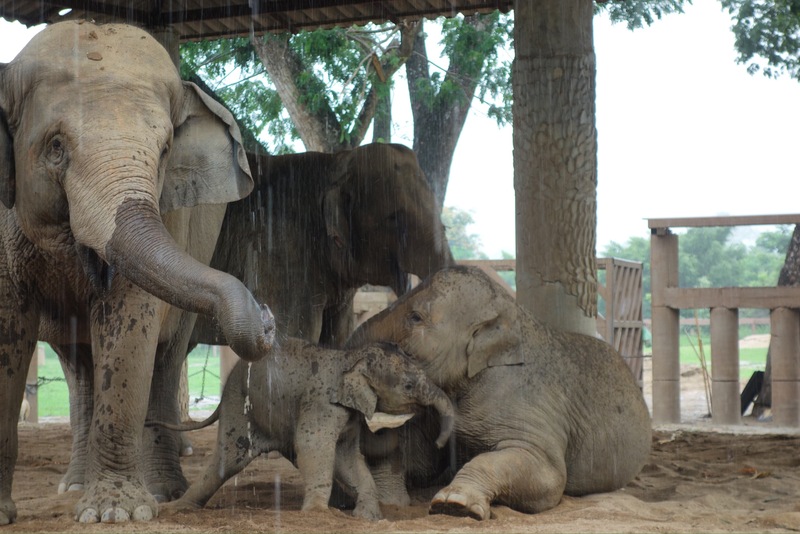 Deplorable cruelty and classical conditioning is used to ‘break the spirit’ of the young elephants. I kid you not, that is the official term to describe how these elephants become so docile. The torture process is called ‘phajaan’ or ‘the crush’ and may last for several weeks. 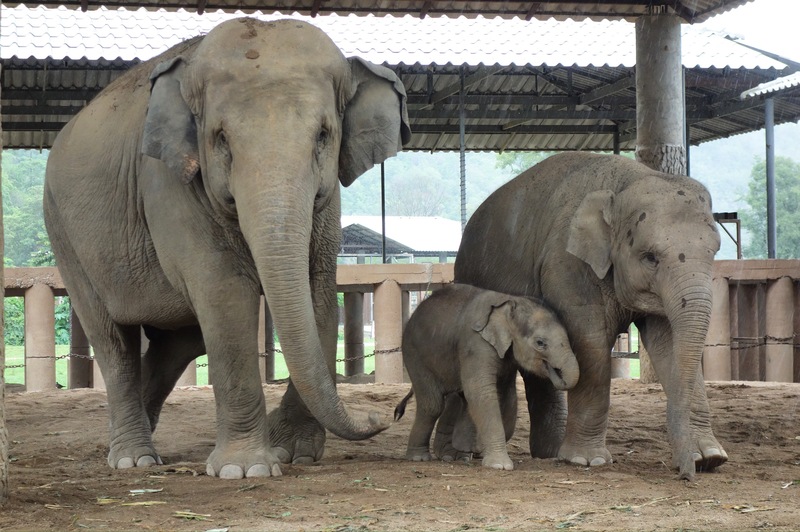 Baby elephants are poached from their parents, often having the entire family killed in front of them as the first unforgettable sign of authority. They are then tethered and hauled to a small crate where they are tied by ropes and chain, having their limbs purposefully stretched and finding themselves entirely unable to move. They will be constantly beaten with bull hooks until bleeding, yelled and screamed at and starved of food and water. The torment only ends when their spirit is broken and the handlers achieve full control. Thus, don’t be under the impression that the hooks you see mahouts carry with them are present incase an elephant revolts, or heads in the wrong direction. They are a purposeful and constant reminder of that soul destroying experience and quite simply a symbol to ensure never-ending fear. I was glad to see no hooks or rusty nails being carried by the rangers at the nature park – just ALOT of food! 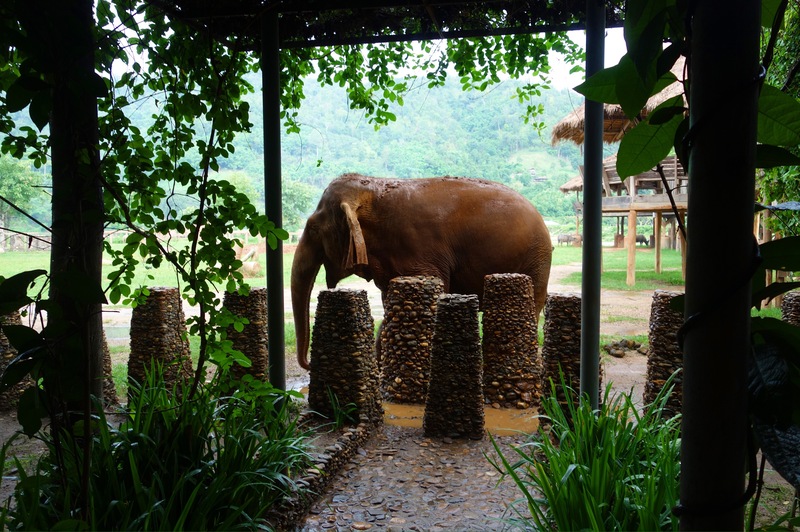 Any elephant deemed dangerous – which seemingly included the vast majority of the males – were kept away from the main site in a large enclosure. When we saw the male elephants blowing dirt in the faces of the keepers it was very clear who was ruling who! If you’re interested in the phajaan process and feeling brave then you can read more and watch a video here or ‘an elephant never forgets’ here. 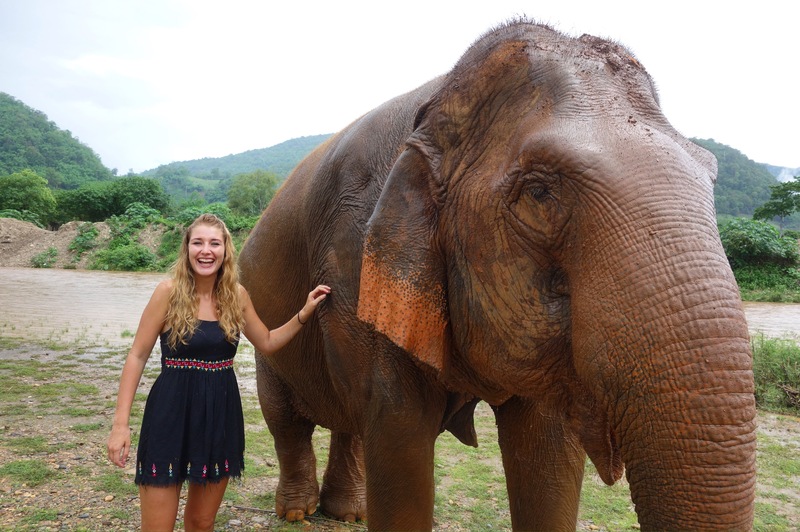 People assume that riding an elephant can’t be harmful – I mean, they’re huge right? But what with the weight of the iron basket, materials to make you comfy, two tourists, plus the mahout…for a whole day in the blistering 30+ degree heat? … I don’t think they get the weekends off either. 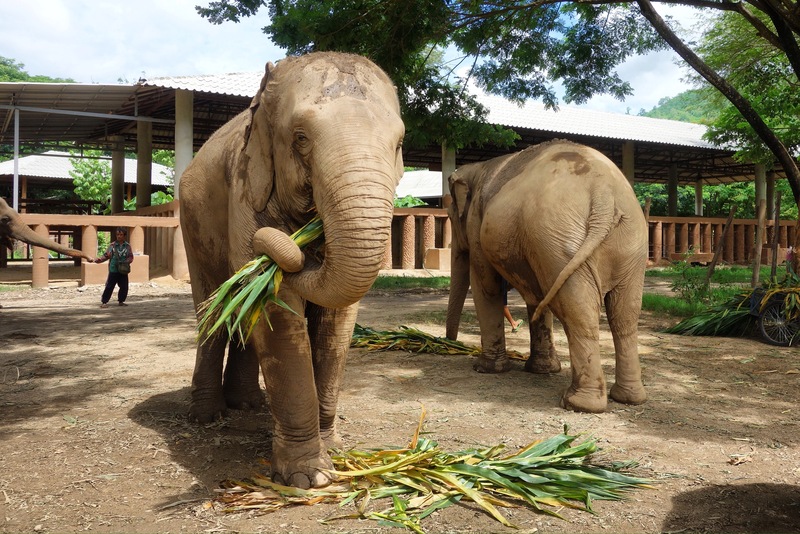 You may have heard the story of ‘Sambo’, a Cambodian elephant that collapsed and died back in April of this year. Believed to be between 40 and 45 years old, she had been carrying tourists around Angkor Wat for 15 years. Veterinarians concluded that Sambo’s death was caused by ‘the hot working temperatures which caused stress, shock, high blood pressure and a heart attack’. Many of the elephants I met had suffered severe leg injuries during their testing labour but were never relieved from their duties because they are simply too valuable. They have learnt to live with their deformed or broken legs, but really they shouldn’t have to. Do I want to ride an elephant? Honestly? Of course I would love to! 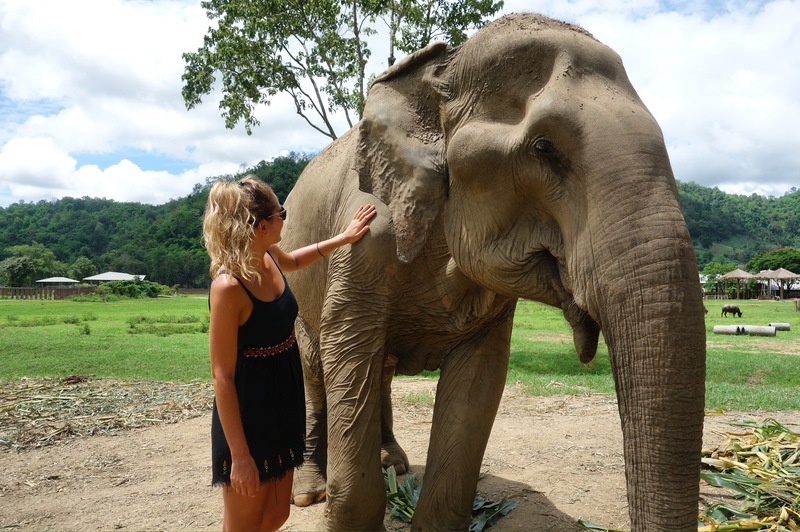 I will probably always have that desire, but after meeting the mentally and physically traumatised elephants that day, I think I’d be ashamed of myself if I did. Thankfully people are becoming better educated in its dreadful past and subsequently the world of elephant tourism is changing. But the plight of the elephant is far from over. We all have a responsibility to ensure their future carries on in the right direction. 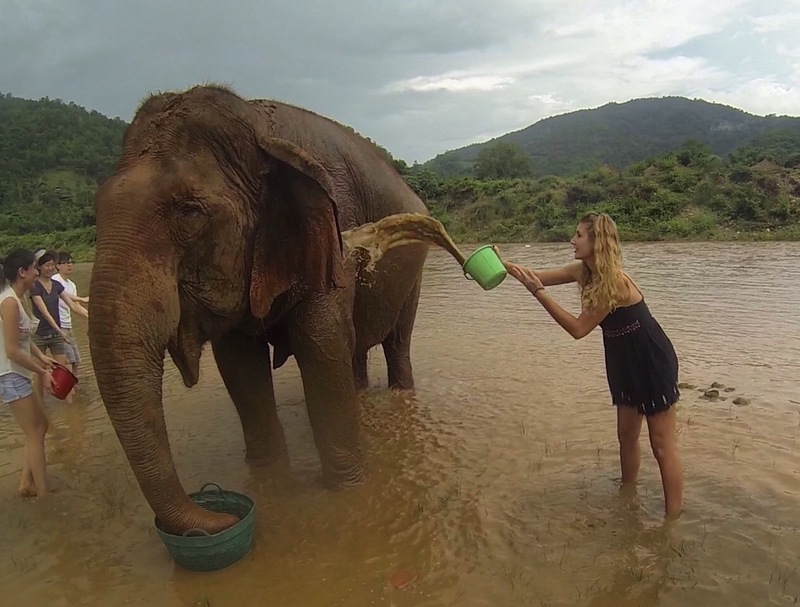 If you are considering signing up to ride an elephant, then I implore you please, to think again. To make your tourism sustainable. To make your tourism fair. Please also try to avoid ignorance in thinking that some organisations are better than others – whichever way you look at it, a life dictated by humans is far from natural for them, and they all have to go through the same horrific process to be controlled in such a way. These beautiful, magnificent animals deserve our respect and love, not a life of exploitation and forced labour. The nature park is made up of several rustic bamboo buildings nestled in a verdurous valley. It’s quiet, and peaceful, and like a picture plucked straight from a postcard. 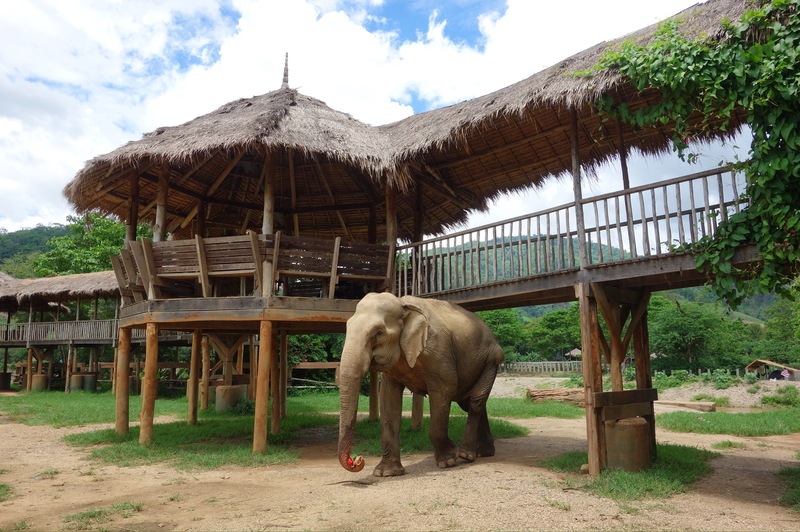 You can even stay the night there and get woken up by the elephants which is so cool! Upon arrival our guide lead us to a lengthy balcony where we had our first spotting of the elephants. It wasn’t long before ‘Lucky’ had spotted us too, plodding over to say hello. 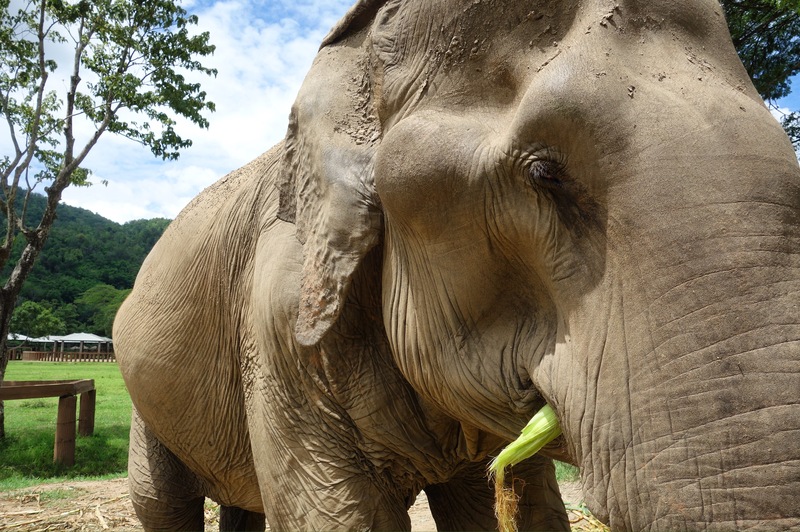 Her powerful trunk poking through the railings, we leant down and took it in turns to hand her watermelons and cucumbers which she scooped up gladly. Above the balcony is placards with the names, pictures and background story of each elephant. I found myself just as engrossed in their astonishing history as I was in the feeding. I located Lucky’s which detailed how she was born in 1985 and was the star attraction of a circus from four years old. She developed an eye infection but was forced to continue performing under the bright lights. The combination lead to blindness, and she became increasingly distressed being forced to perform when blind. 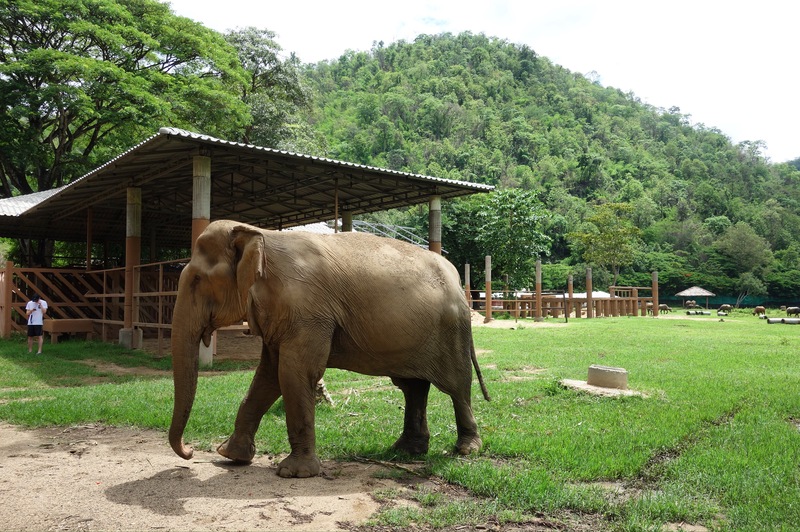 She was finally rescued and bought to the Elephant Nature Park in 2013. 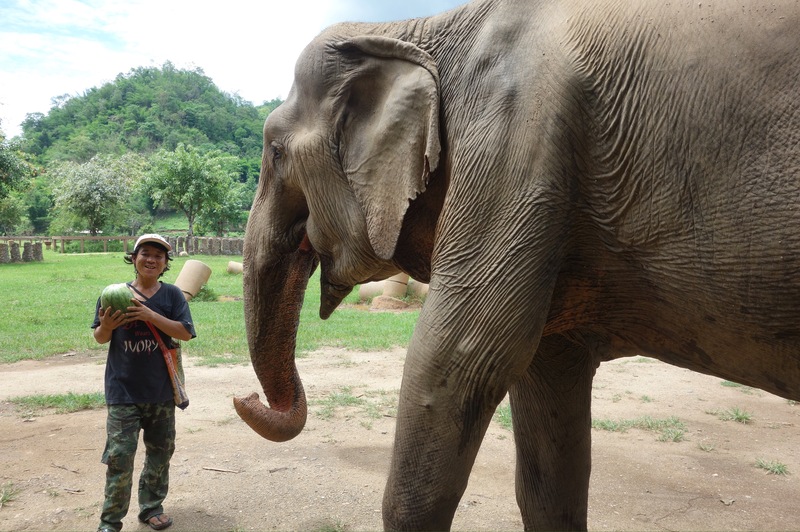 We went for a walk around the park, meeting many elephants and their allotted keepers along the route. Our guide was exceptionally knowledgable and able to tell us a significant amount about each elephant, though most of them looked the same to me. We had to be careful where we stood in relation to the elephants so as not to frighten them. A fair number were blinded or partially sighted from the overuse of camera flashes and lights in public performances, deliberately blinded as punishment or by car headlights when being dragged through urban areas for use in street begging. Yet, I felt safe in their presence, and they didn’t seem too bothered to have us around. As we saw in the afternoon, the rain started tumbling down, totally drenching us. Looking for some shelter, our guide took us to an enclosed pen housing a small family of elephants including the most adorable one month year old Tembo Mdogo. He had such a playful character, and we all got totally lost in watching him mess around in the rain with his much bigger older sister. Though I forgot to jot it down, his name meant ‘flower of love’ as the keepers were initially under the impression he was female. Poor little guy. The rain began to clear a little, so we headed down to the river with the park’s largest resident in tow. We were all handed buckets and given the opportunity to throw water on her from a short distance. Unfortunately for us, the muddy bath didn’t last too long as she decided she’d had enough after a few minutes. I was very torn with my feelings at this point; what we experienced was real life, was uncontrolled and totally up to the elephant, but I have to admit it made that part of the day a bit underwhelming. 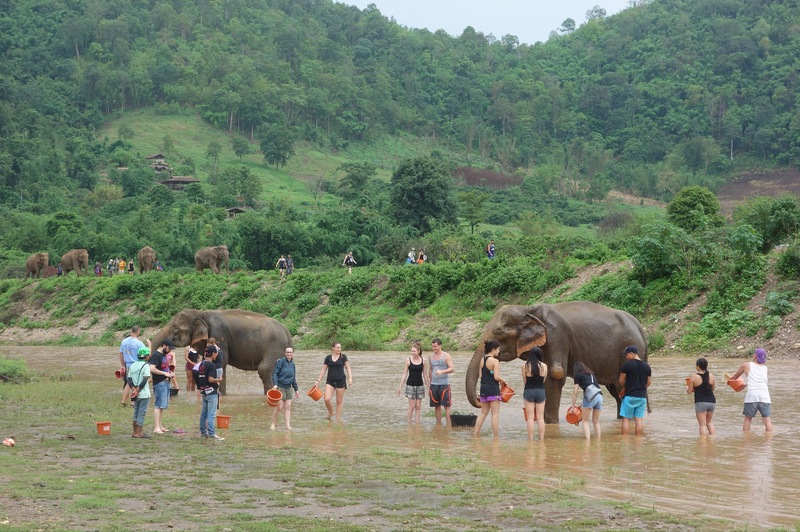 Taking time to bathe with the elephants had been the bit I was most excited about, and had been keen to do so long before I even left English soil. 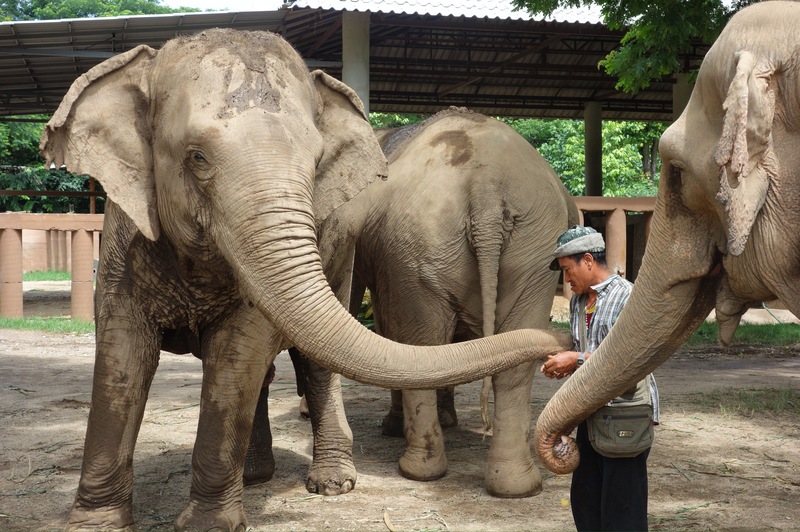 I had heard stories and seen friend’s photos where they are being picked up and hugged by the elephants trunks, or having a big sloppy trunk snog on their cheek. Due to religious reasons we couldn’t wear bikinis and only ever ventured in calf deep. I wanted to get stuck in and enjoy myself, but the whole event was over before I knew it. So unfortunately, the activity I was most looking forward to turned out to be the most disappointing part of the day. Regardless (as you can see from that stupid smile above), overall I had a fantastic time! It was a pleasure just to be amongst the elephants, and to know I’m giving my money to a good and reputable cause. If I was to do it again I would perhaps do the two day trip so I could stay there and not be so rushed. Or perhaps I’d pick another charity like the Elephant Retirement Park or the Elephant Jungle Sanctuary. There’s an increasing number of rescue parks out there (which is great – though hopefully one day they won’t need to exist! ), you’ve just got to do your research! Pingback: Going solo. – a lottie lost. ← Thai Farm Cooking School, Chiang Mai.